A “Dialogue without Words:” whose modified motto of Mendelssohn’s popular “Songs without Words,” compares to a fiction in a double sense. On the one hand, it lies within the motto itself: Piano works and instrumental music don’t “speak,” at least not in words. Thereby “spoken” music making is formed as a pivotally important category of the characterization of the music. Of course, its sense of feeling still remains outside of the obvious connection to words. 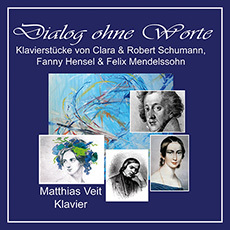 A dialogue between composers is fictive in reality, however, with piano pieces which stand on their own, and from which a line drawn from an already closed cycle is formed to its sequential arrangement in this program seems interrupted and “confronted” with pieces of other composers. One must at least ask oneself how a conversation might have taken place in which the participants, Fanny and Felix, Clara and Robert, perhaps never got together.